Newlands is a luxurious 4 star, 2 bedroomed apartment arranged on the first and second floors with some fine views across Keswick to the Lakeland Fells beyond. 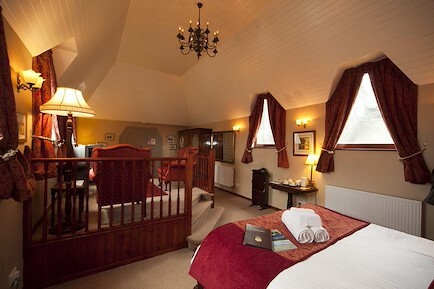 The apartment was formally part of the Royal Oak Hotel, which is a Grade 2 listed building, and is situated in a quiet location, just off Station Street in the town centre. The apartment has been completely refurbished and is beautifully furnished and decorated throughout. Accommodation is provided to sleep up to 4 people. Newlands is fully double glazed and central heated to ensure that it is warm and cosy - even in the depths of winter. The building is entered via a pedestrian area, and has the advantage of audio/video entry system for peace of mind. On entry to the building, the grand communal staircase leads up to the first floor, or alternatively the lift can be used. A separate corridor then leads to the entrance to the apartment. On entering the apartment, a hallway leads off to the double bedroom and further bedroom with bunk beds. Both have co-ordinated furnishings and ample hanging room and storage space. The bathroom has an electric shower over the bath, with wash basin and toilet. A private staircase then leads up to a landing where the living accommodation is found. The large lounge has comfortable seating, TV and DVD with X-Box games console. A double sofa bed provides sleeping for a further 2 occupants if required. Magnificent views towards the fells can be enjoyed from the lounge windows. The fully fitted kitchen has an electric oven with gas hob, microwave, fridge-freezer and washer drier. The adjacent dining area seats 4. A private, secure parking space is provided for convenience and peace of mind. An access statement can be provided on request. Bed linen ( towels can be requested). No smokers or pets please. Newlands is located just off Station Street, and is accessed through a pedestrian area on the entrance to Packhorse Court. It is in the centre of Keswick and is only a short walk to the Theatre, Derwentwater and the River Greta/Fitz Park. The secure private parking space is in the enclosed square over the road. Your enquiry will be sent directly to Newlands Apartment. Please fill in as much detail as you can.